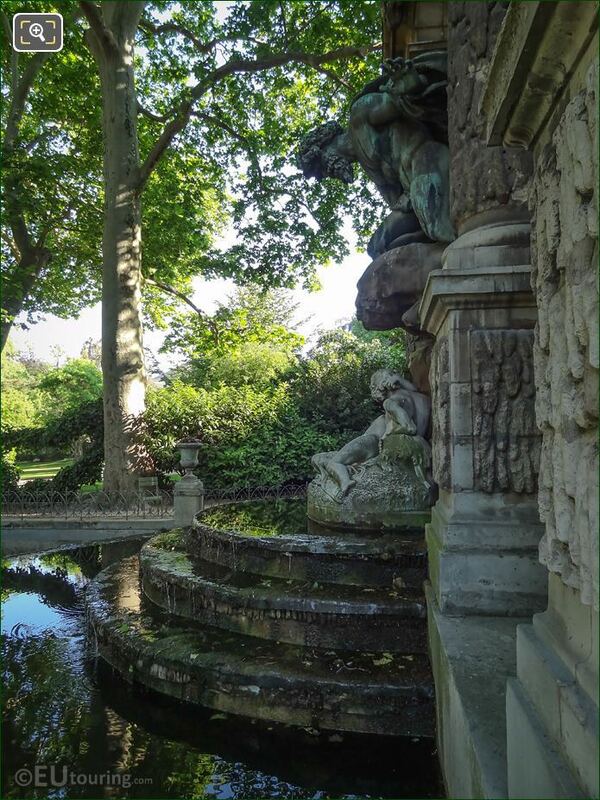 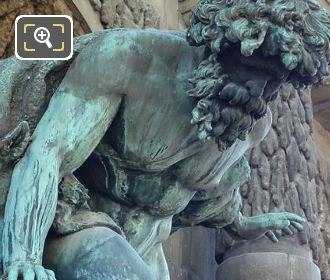 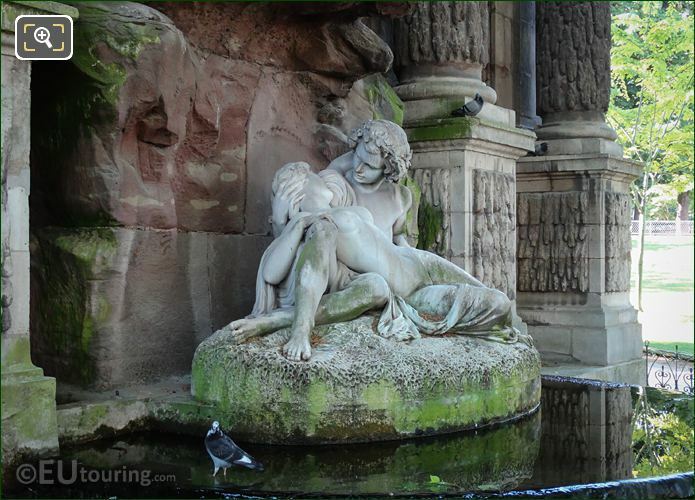 This time while we were within the Jardin du Luxembourg, we took these high definition photos showing a statue group called Polyphemus Surprising Acis and Galatea, which is located on the historical Fontaine Medicis. Known in French as the Fontaine Medicis, or in English, the Fountain Medici, this was originally designed back in the 1600s when Marie de Medici, who was the Queen regent for her son King Louis XIII after her husband died, decided to have a palace built and gardens laid out in a style reminiscent of her days in Italy, which we know today as the Jardin du Luxembourg. 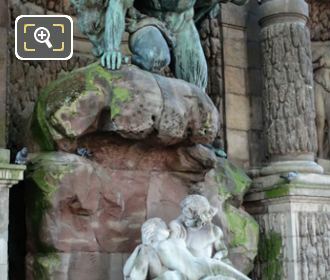 However, what you can see today of this famous tourist attraction is not the same as the original, as the statue group called Polyphemus Surprising Acis and Galatea, which you can see in this HD photo, was only put in place in 1866 when the whole fountain was moved from its original location, and this new statue group was sculpted by Auguste Louis Marie Ottin. 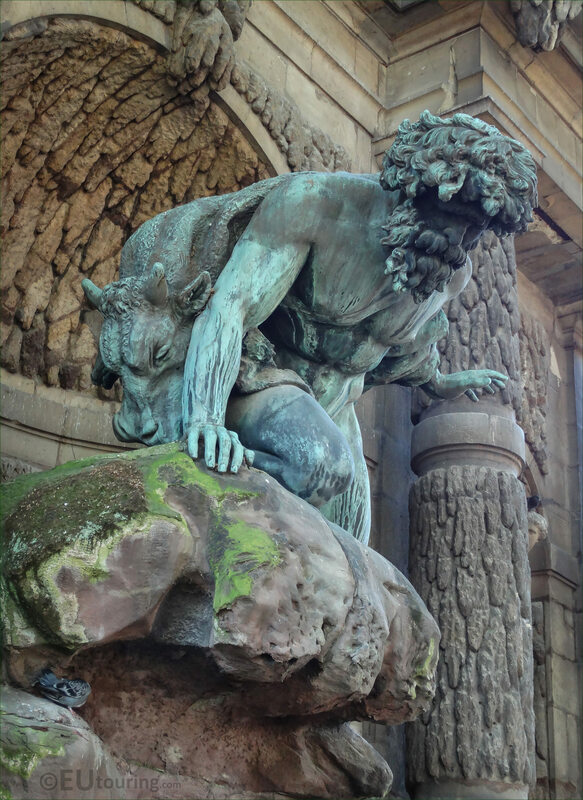 Now this next photograph shows a close up of the bronze statue of Polyphemus, which was designed by Auguste Ottin to be looking over the ledge to a cave jealously where he had just discovered the lovers Acis and Galatea, and this is a story from mythology, although there are different versions. And this next close up photo shows the white marble statue group of the lovers Acis and Galatea, who in this version of the mythological tale were hiding by a cave from Polyphemus, and this particular composition replaced an earlier statue of Venus that had been put in place in the early 1800s, when the fountain was initially restored under the orders of Napoleon Bonaparte. 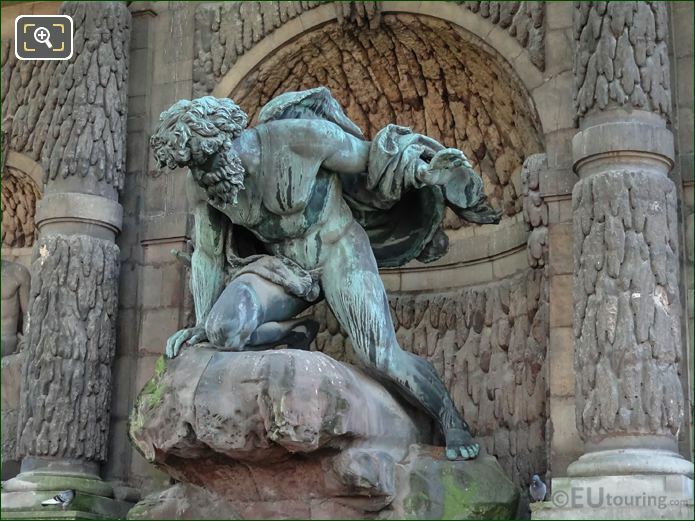 Yet this next high definition photograph shows another view of the Polyphemus statue designed to be Surprising Acis and Galatea, and Auguste Ottin took this particular theme from the story that appears in Ovids Metamorphosis where Polyphemus, who is a land God is jealous of Acis, as he loves Galatea, who is a sea Goddess. 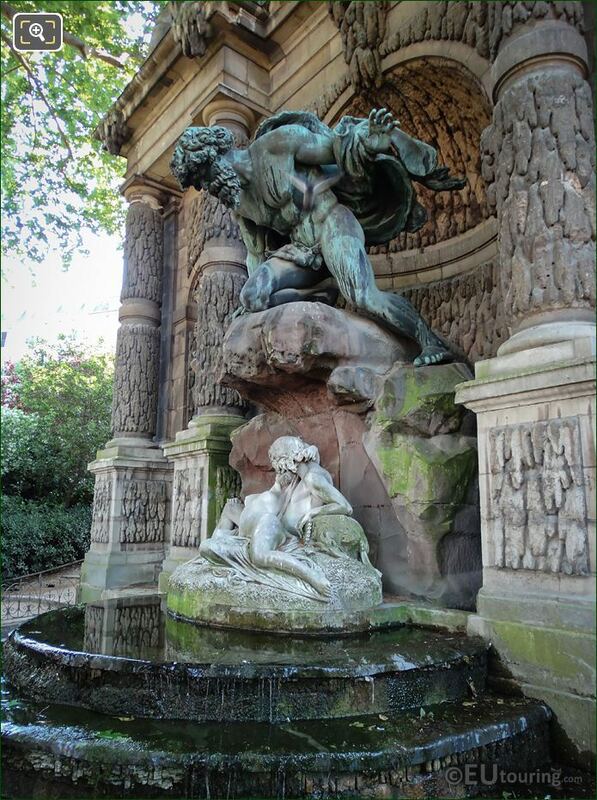 So, this next image shows a side view of the statue composition of Polyphemus Surprising Acis and Galatea, which as we have mentioned was produced by August Louis Marie Ottin, who was born in Paris 1811 and became a pupil of David d'Angers and the Ecole des Beaux Arts to become a French sculptor. 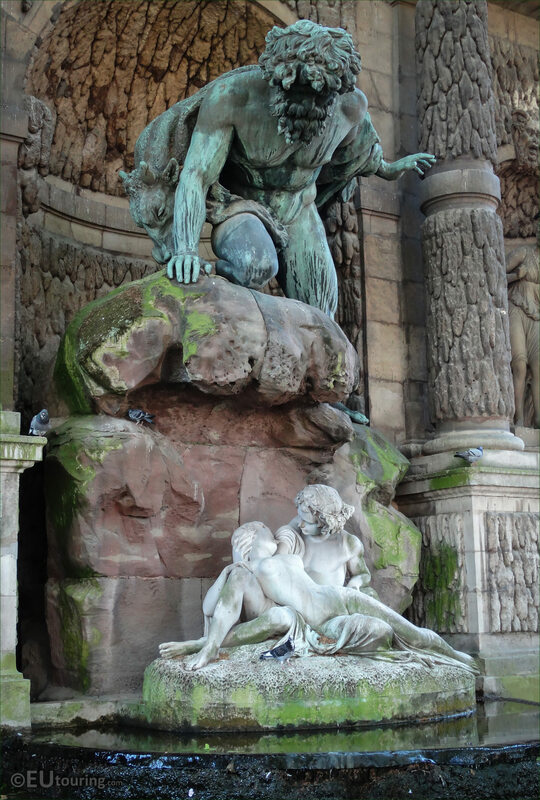 And after presenting works at different salons, he won the Prix de Rome, thus receiving numerous commissions for places such as The Louvre, the Palais Garnier Opera, etc, yet it was the statue group of Polyphemus Surprising Acis and Galatea, which brought him the most fame, and he was awarded the Legion of Honour. 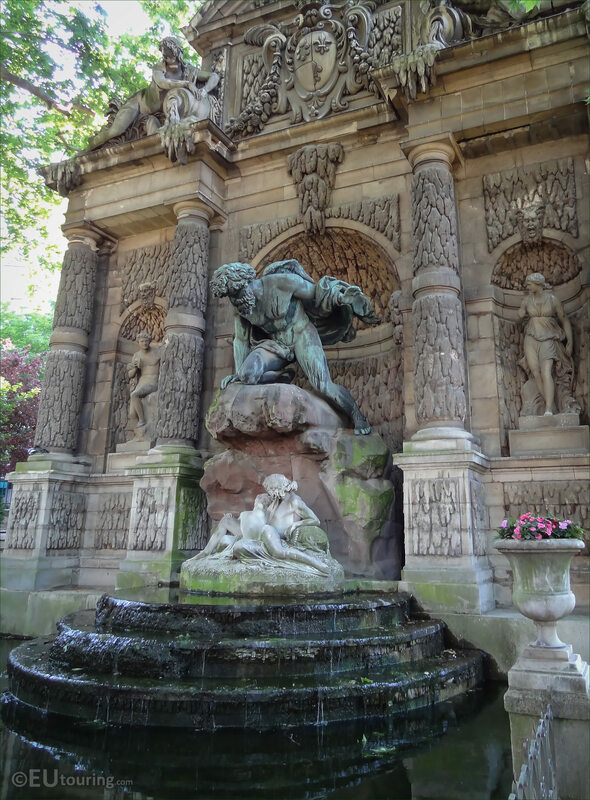 But this last image shows more of the whole Fountain Medici, which was originally designed like a grotto aspect for Queen Marie Medici, and you can discover this with its impressive statues right opposite the side of the Palais du Luxembourg to the north east of the Luxembourg Gardens, and next to the Rue de Medicis.